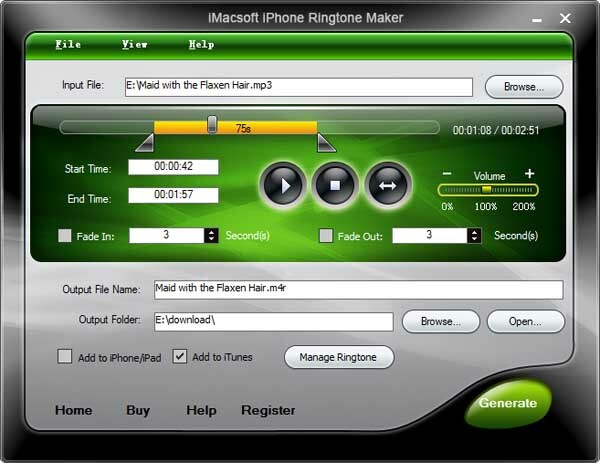 iPhone Ringtone Maker supports various types of iPhone, including iPhone, iPhone 6, iPhone 6 plus, iPhone 5S, iPhone 5C, iPhone 5, iPhone 4S, iPhone 4, iPhone 3GS and iPhone 3G. 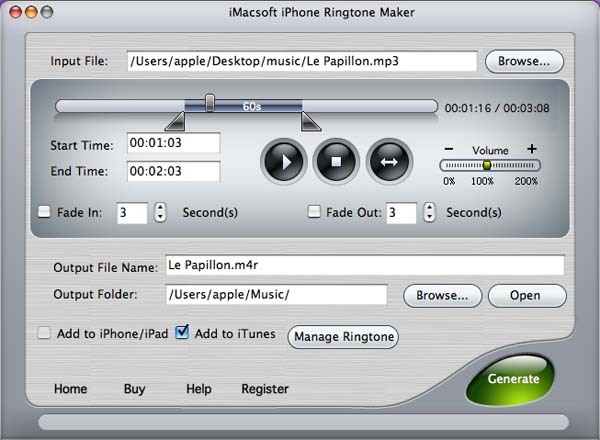 You can make your own iPhone ringtones with the help of iPhone Ringtone Maker with ease. With the iPhone ringtone Maker, any music you love can be converted to ringtone for iPhone due to the support for a wide range of music and video formats like MP3, WMA, APE, WAV, M4A, AVI, MPEG, WMV, DivX, MP4, H.264/AVC, AVCHD, MKV, RM, MOV, XviD, 3GP, etc. Freely make custom text message tones or alerts for iOS 8/7/6/5 and transfer to iPhone directly without iTunes. 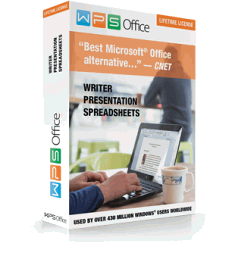 Make text message or alerts with length 2-5 seconds or longer than 5 seconds. The smart iPhone ringtone maker can automatically transfer the converted ringtones or your ringtone library to your iPhone with or without iTunes such that you can hear these fantastic ringtones when your acquaintances call you. You can transfer and export ringtones to iTunes to backup your ringtones with the help of ringtone maker. iPhone Ringtone Maker supports multiple languages and you can choose from English, German, French, Spanish, Japanese, Arabic, Italian, Chinese, and more. iPhone ringtone maker is always update to support the latest version of iPhone devices, iOS and iTunes version. Windows 8, Windows 7, Windows Vista, Windows XP, and Windows 2000. Mac OS X 10.4(Tiger), 10.5(Leopard), 10.6(Snow Leopard), 10.7(OS X Lion), 10.8 (Mountain Lion), 10.9 (Mavericks), and 10.10 Yosemite.